Like Frank’s Red Hot, we put this sh*t on EVERYTHING! Bath Salts – a few drops of oil to a cup of Epsom salts in a mason jar, shaken, make a ridiculously relaxing bath. Refreshing the sachets/scent bag in your lingerie drawer – a drop or two of oil into the bag will refresh old sachet bags. For those of you with curly hair – curl refresher – 5-8 drops to a liter of water (distilled or boiled tap), shaken and spritzed in the morning will give you a relaxing set of not relaxed waves/curls. Setting makeup – a drop in a cup of water can be spritzed onto face to set your makeup (as well as be refreshing after a long day at the office or a drying plane trip). Sleep easy – a few drops to a cup of water or witch hazel in a spray bottle spritzed on your pillow before bed makes for an aromatherapy dream. Relaxing bath – 3-6 drops (depending on standard or garden tub) to hot bath water will create a relaxing bath, as well…because, let’s face it; we don’t all always have Epsom salts in the pantry. Just sayin’. Insect bites – a drop on a Q-tip or cotton ball applied to an insect bite. Lavender is said to be antiseptic and help destroy germs that can cause infections, soothe itching and speed healing to help reduce scarring. Sunburn – a few drops in a cup or so of distilled water in a spray bottle will relieve sunburn (although I have also found vinegar to really kill the sting of a more severe burn). RELAX, Yo! – add a few drops of oil to unscented massage oil to turn your session into an even more relaxing one. Lotions, body butters, etc. 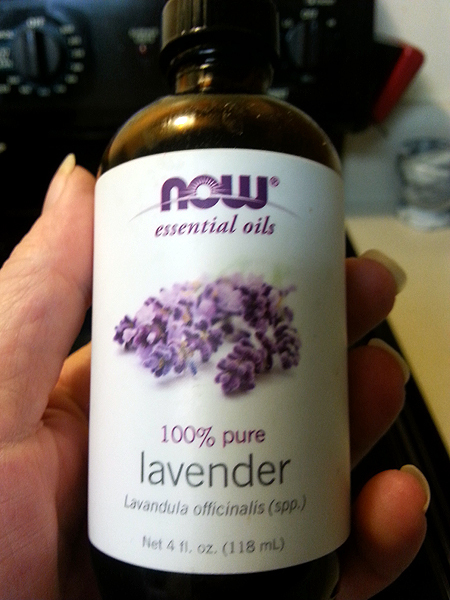 – If you are making your own concoctions for skin/body care, lavender is a soothing addition to your skin care. My body butter recipe is here. Laundry rinse – combine a teaspoon of oil to 2 cups of distilled white vinegar and add about 1/4 cup to the rinse cycle of the wash. The scent of lavender has been associated with stress relief, headache relief and relaxation. It makes a great base for bath salts/oils, massage oil, pillow and room spritz, and pain relief (in fact, I used it with some mint, eucalyptus and rosemary for a pain relieving lotion stick last weekend). We sent my SIL a care package that included bath salts, sugar scrub, body butter and a lotion stick that incorporated lavender, as well as a vial of lavender oil and I wanted her to see just how versatile this wonderfully scented oil can be. So I ask the rest of you…Do you have a lavender oil hack/fix/use that I didn’t mention here that you’ve tried and found worthy? If so, please feel free to add them in the comments section! This entry was posted in DIY, Family, HomeMade, Of Interest and tagged bath oil, bath salts, body butter, lavender oil, lotion stick, uses for lavender oil. Bookmark the permalink. I have an oil burner, so I may just do that! I tried to get some Christmas-y scents, but found that the best ones were in soy melts. I love balsam fir. I tried a few on eBay, but they weren’t good. I found a really good candle company and got a few jars of balsam fir soy candles. Same here. I miss the scent of a real tree, and the balsam fir scent fills the house and does the trick. i spread a little on a light bulb and turn it on…Makes the whole place smell WONDERFUL!